The vast majority of professional brewers will never reach the kind of high status position enjoyed by Mitch Steele when he was the brewmaster of Stone Brewing Co. There, he was the famed brewing mind behind one of the country’s most beloved craft brewers, the 9th largest in the U.S., according to the Brewers Association. He was the man who literally wrote the book on IPA—you can find a copy in any homebrew store. Aspiring homebrewers with dreams of opening their own breweries would have killed to be in his position. And then, Mitch Steele walked away. In June of 2016, Steele announced he was departing Stone to get back to his small brewing roots, in a project that eventually developed into New Realm Brewing Co. in Atlanta. As the brewery built out and tested future beers this summer, we grilled Steele on the shape of his future brewing ambitions. Now, as 2018 dawns, New Realm just had its public opening, so we present a few highlights of that conversation in honor of Steele’s new project. Paste: How hard was it to walk away from a place where you were one of the most recognizable brewmasters in the country? Mitch Steele: I wasn’t planning on leaving, but you know, as these breweries get bigger and bigger, you struggle with the fact that you get further removed from the brewing process. You become a manager, you’re a strategist; you’re doing practically everything but brewing. I loved Stone, but thought I might kick myself for the rest of my life if I didn’t explore this. Paste: As a hop savant, what are your thoughts on the current state of IPA? Mitch Steele: Well obviously, IPA has become the mainstream face of craft beer. Even people in the past who might have wanted something in the golden ale camp, or even the lightly sour camp, seem to be drinking IPA. I think primarily, it’s palates evolving. The IBU arms race is long since over, and people are looking for balance. They’re also more adventurous in their drinking habits—so many come in and say “I want to try whatever is new, whatever I haven’t had before.” We’re all guilty of it. That certainly makes it hard to plan and project as a brewer what you should be making. Each new beer might take off and be solid for years, or it might be irrelevant very, very quickly. Paste: You once said that it was more or less no longer possible to sell pale ale in San Diego, because of IPA’s popularity and name cache. Do you still feel that way, and what about Atlanta? Mitch Steele: I don’t think it’s to the point that people won’t try other beer styles here in Atlanta. If you go into a multitap bar, you’ll see a fair number of IPAs, but you’ll also see a good variety of other beer styles. What I was starting to see in Southern California were multitap bars that were 75 percent IPA at any given time, and that’s just too much. My thought is that there’s a lot of great beer styles out there, and it’s nice to have choices. (Ed. note: It’s worth noting that even Stone was eventually forced to discontinue its pale ale, once the brewery’s flagship.) Losing variety in beer styles at the expense of one or two popular styles is a bad thing, because I think craft is totally built on providing variety, and if you lose that, you lose part of what craft is all about. In what is sure to be a rare sight, New Realm briefly got some snow on its Atlanta facade this winter as Steele and his partners prepared for opening day. Paste: But at the same time, you’ll be making IPA at New Realm. What might that look like? Mitch Steele: I want to start off with a West Coast IPA because I suppose that’s what I’ve gotten to be known for, and I love it. I’ve got a hop combination I’m really excited about. Paste: Obviously we have to talk about the hazy, New England-style IPA as well. Can you ever see yourself producing a beer that looked and tasted that way? Mitch Steele: I’m still trying to figure the whole New England IPA thing out. I haven’t said if it’s on the list or off the list for us at New Realm; I’m not ruling anything out. It really does seem to be a love it or hate it thing, because like any beer style there are good ones and bad ones. Honestly, I haven’t had enough to know if I’m a fan or not, but there’s some very interesting science going on with the flavor development of these beers that I’m fascinated by. 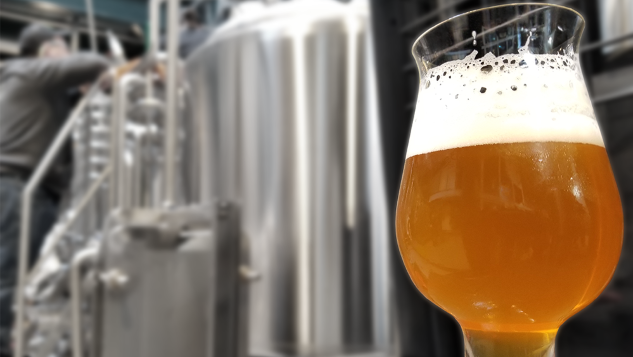 I can tell you that it’s very hard to brew a beer that looks so hazy and get that kind of hop flavor, and a lot of people are trying to emulate it and failing. Paste: What other styles have you been itching to brew? Will we see anything in particular from New Realm that you wouldn’t have regularly been able to explore at Stone? Beyond that, I actually want to try and brew some English cask-conditioned beers, because it’s something I’m passionate about. I don’t know if they’ll sell, if they’ll work, but we won’t send them outside of our own restaurant. Paste: That’s really interesting—people don’t look at your history and think “cask-conditioned English ales.” Any particular styles you love in that part of the beer family tree? Mitch Steele: I love a good ESB, maybe an old-school English IPA. In the past 10 years I’ve gone to England about 10 times and had a chance to brew with some really good English brewers. The whole ceremony around a good cask beer is really appealing to me. It’s very rare for me to drink anything but real ale while I’m in England. We did a lot of cask beer at Stone, but we were never able to do what I would consider an English-style cask beer fined with isinglass or gelatin, naturally carbonated. Media congregate at New Realm during a sneak peek prior to opening. Paste: What do you make of Anheuser Busch-InBev’s continued acquisitions of craft breweries such as Wicked Weed? Mitch Steele: Like a lot of people, I’m still trying to make sense of it. Number one, I don’t like it, and that’s a fairly easy position to come to. It absolutely is an attempt to buy legitimacy. When I was at Anheuser Busch, we made some really nice beers, and the one thing we realized as we were trying to sell them was that the people who drink craft beer don’t want craft styles with the Budweiser or Anheuser name on them. So as a result, buying these established brands is their attempt to control all segments of the beer industry, there’s no doubt. Is that a terrible thing, a death knell for craft? I don’t think it necessarily is; you see it in the wine and spirit business all the time. If everyone was on a level playing field, this wouldn’t be something to get terrified about. But we’re not, because a company like ABInBev has the financial clout and are not concerned about the existing laws that are not being enforced, that they can go and do that. Buying tap handles is illegal, but they do it and they have the money to pull it off, and small brewers can’t. They build the fines they’re going to accrue into their marketing budgets and just deal with it. The danger to craft is not in the beers owned by AB-InBev, but how they’re sold. That’s a very real problem and a very real threat. Paste: So with that said, what are the chances I’m writing about New Realm being acquired by AB-InBev, five years from now? Mitch Steele: Zero. It’s not going to happen. Honestly, we’re all appalled by what ABI is doing right now. It scares the crap out of us, and we don’t want to be part of that. We’re trying to build this for ourselves, not someone else. Jim Vorel is a Paste staff writer and resident beer guru. You can follow him on Twitter for much more beer and liquor writing.